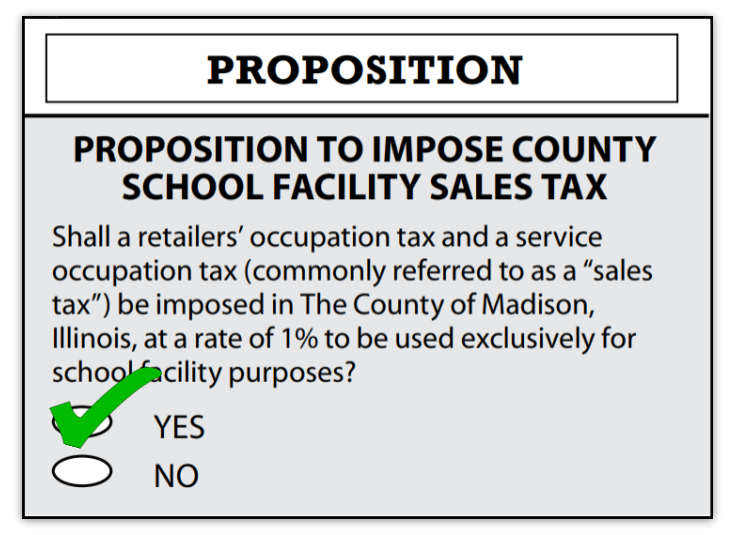 Madison County is not unique in trying to pass the 1 cent sales tax. 49 other counties in the State of Illinois have successfully passed CSFT. Madison County neighbors Bond, Macoupin, Montgomery, and Jersey Counties have all passed it. This means that all of these 49 counties have visitors and non-residents helping to fund their schools and lower their property tax rates. It is estimated that 30 to 40% of sales tax revenue in Madison County would come from visitors and non-residents. This means that we can allow visitors to help lower our property tax rates and help fund our schools. While early on, some counties were unsuccessful in passing CSFT, this trend has changed drastically in recent years. In the November 2016 and the April 2017 elections, CSFT has been on the ballot in sixteen counties and the measure has passed in ten of them. What has been the reason CSFT has become a popular option? A major reason is property tax relief! As property tax has become a more important issue, county residents have realized that CSFT offers a way for local school boards to provide financial relief to property owners and help to offset building and maintenance costs with a new stream of revenue. Once the 1- cent sales tax passed in Pikeland (Pittsfield), The Board immediately air conditioned two buildings at no additional cost to property owners and started abating $420,000 of existing bond debt in local property taxes each year. The District tax rate is now 50 cents lower than it was before the sales tax went into play. Mount Zion School District #3 Board of Education took action and lowered the district property tax rate by 20 cents by abating $500,000 in existing bond deb. In addition the district has been able to build a fieldhouse, auditorium, additional classrooms, remodeled cafeteria, and installed a turf football/soccer field. The Board of Education at Prairieview-Ogden CCSD #197 began paying off a $1,000,000 Bond; therefore saving the taxpayers about 24 cents per year on the tax bill for the next 15 years. Jacksonville SD 117: $26 million renovation/expansion of middle school and $6 million renovation of elementary school. Greenfield CUSD10: Addition and renovation of elementary gymnasium. Property owners are also saving as the District is abating existing debt. Herrin Unit #4: Building projects at three different schools, upgraded football complex, and built a new sports complex. The district has also used sales tax revenue to abate existing debt. Southwestern CUSD9: Windows upgrade, electrical upgrades, and HVAC project. Property owners have also saved money as the District continues to abate existing debt with sales tax revenue. Crab Orchard CUSD3: Have built three additions to district schools with sales tax revenue and have saved property owners by abated existing debt. The State of Illinois has put school districts in a terrible situation. While Illinois legislators says that 2016-17 is the first time that K-12 education is being fully funded, that is not the case! While districts are receiving General State Aid, no other payments have been made. Districts rely on the State of Illinois for funding for special education, transportation, and pre-kindergarten and are still waiting on payments. CSFT offers school districts a new source of revenue that does not flow through the State of Illinois. Therefore, just like local property taxes, districts can count on sales tax revenue to come to districts on time.